CAFFE CULTURE PREVIEW - Marco Beverage Systems Ltd. Proudly sponsored by Marco and featuring stellar coffees from some of the finest roasters in the world – Coffee Angel (Irl); Counter Culture (US); Da Matteo (Swe); Hasbean (Eng); Intelligentsia (US); Square Mile (Eng) and Tim Wendelboe (Nor). Hand brewed by a slew of international barista volunteers (volunteer here if you fancy it), using a variety of brewing aparatus – Chemex; V60; Siphon; French Press and Aeropress. All brewed with the aid of Uber Grinders; Uber Boilers and Ecoboilers. So come along for some of the finest brewed coffees – free! you’re bound to bump into someone interesting. Marco Booth (E105)At the Marco booth we’ll have an extensive range of water delivery systems including a few new innovations coming from the Uber Project. I think you will like what you see, but more importantly, we’d love to get your feedback on what you think, before we bring these next ideas to market. Amongst other stuff is the Ecosmart, a countertop water boiler with variable temperature selection, pulse options, volume selection and live temperature readout. The Baratza grinders will also be on display. Of course we’ll have an Uber Grinder and Uber Boiler too- come play. 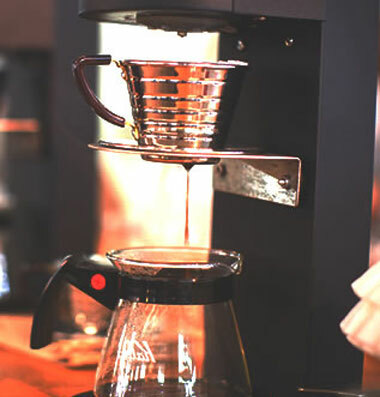 Our brewstation will feature hand brewed coffees from SquareMile and the singular Grower’s Cup brewers with their customised boiler for precision brewing. We’re excited to have some special guest coffees from Ninety Plus including the (in)famous Nikesse. Teasmith provides the teas. We’ll also have upgrades to some of our commercial brewers – again to deliver precision to your brewing. Guest baristas (i) include Colin Harmon on Wednesday, David Walsh, and a few others. Come see. Vince Fidele of Mojotogo will be around the Marco booth showcasing the wonderful Mojotogo and will be on hand on Thurday afternoon if anyone wants to make sure they get their questions answered by the man himself. Scott Rao’s Everything but Espresso will also be at our booth for those interested. I’ll be delivering a seminar on brewing techniques using hand brewing methods. I’ll cover the relationship between key brewing fundamentals and their effect in the cup. I am delighted to have a special guest Vince Fidele from Vstapps, of Extract Mojo and Mojotogo fame to guest present. Vince will go through the mojotogo and everybody will get a chance to brew and measure and taste. It’s on Friday 25th at 12.00 noon and WILL be finished in time for the WBC final. Book here. An amazing competition, the 3rd World Aeropress Championship will be hosted at the Marco Brew Bar. Some of the world’s finest baristi (as) will go head to head to deliver the finest representation of Square Mile’s seasonal Yirgacheffe. Competitors include James Hoffmann, Ben Kaminsky, Nick Cho, David Walsh and Steve Leighton to mention but a few. Oh.. and we’ll have some draught Guinness on our booth for end of day brews – at the right temperature of course :). Look forward to seeing you all there – come say hello.